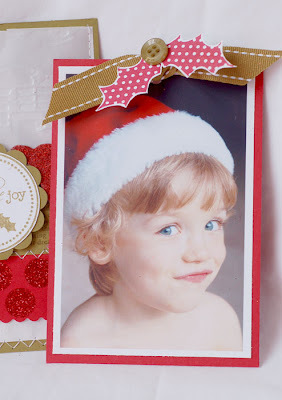 Last year, the girls at Papertrey Ink did a feature incorporating holiday photos into the design of their cards. It was such a hit, that they decided to do it again! Since I'm the Guest Designer, I get to play along!! This was a really fun assignment. 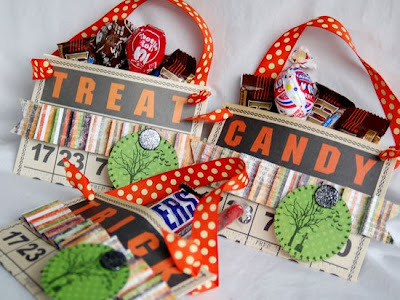 I've been seeing glassine bags used in fun ways, other than for holding treats, so I decided to give it a try. 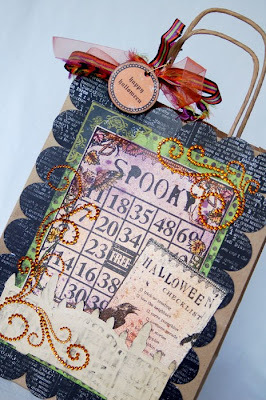 I embossed the bag with the sheet music Cuttlebug embossing folder. 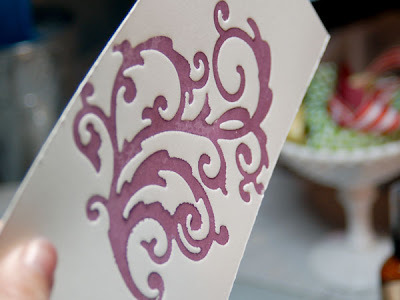 Then, I stitched it onto a piece of Ripe Avocado cardstock. 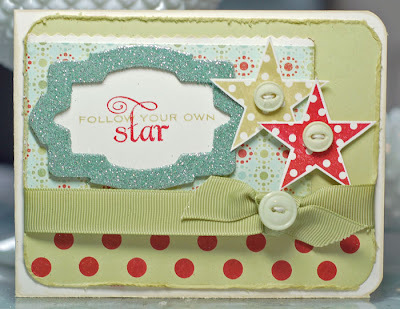 Next, I used my glue pad and stamped a polka dot border using Polka Dot Basics 2onto Pure Polly. I added the glitter. 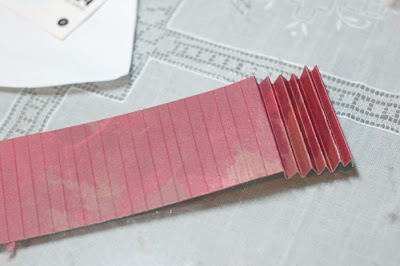 (Note, it's best to let this set overnight) I also used Versamark to stamp a panel of Ripe Avocado cardstock using Text Style 2. 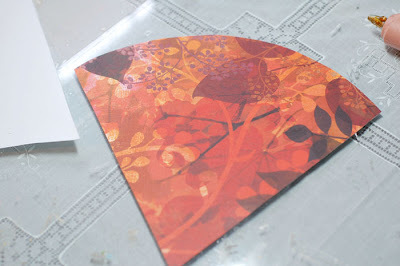 I stitched the two panels together and adhered them to the card front. 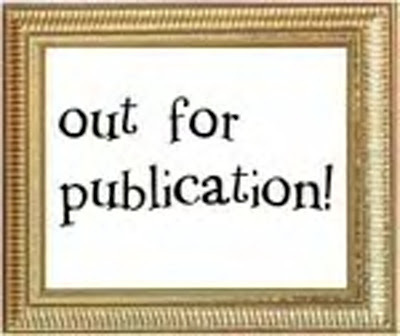 Next, I adhered my photo to a piece of Pure Poppy cardstock and punched a hole in the top. I tied some Ripe Avocado saddle stitch ribbon through it. 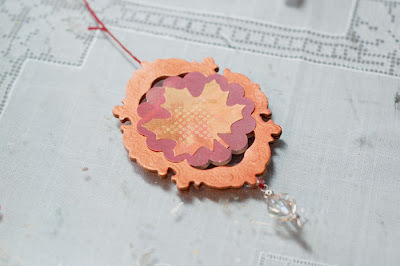 Then I stamped the holly leaves from Holiday Button Bits and cut them out, adhering them to the ribbon with a button. I slid the photo into the bag. 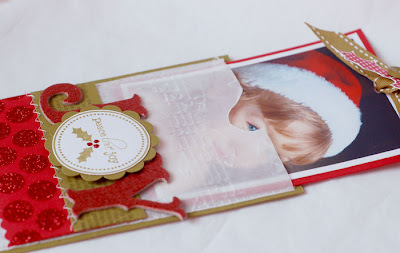 The result is a fun card that can be sent with a little photo for the recipient to pull out and keep. 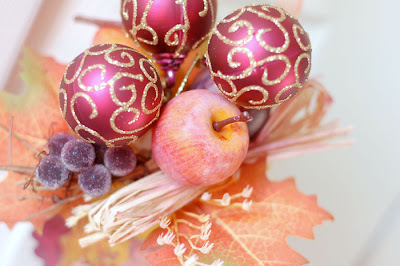 And if you want even MORE inspiration, here's last year's post on Nichole's blog. Well, the little guy was quite sick yesterday, but really rallied today. His fever was much lower and he was perkier. I have to say that having a rainy day home together has been wonderful. :) We made some cookies, did some school work and just snuggled. One more day and I think he'll be ready to go back to school, much to his disappointment. 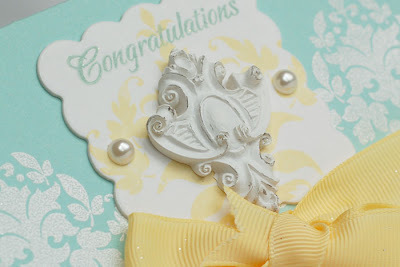 Just a quick post to share some Webster's cards that I've done lately. 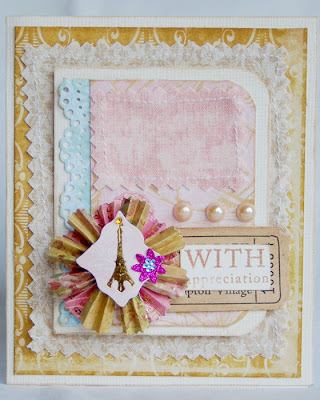 This first one uses Postcards from Paris and some fabric. The sticker is K and Co. and the ticket is vintage. Speaking of Webster's, I'm so excited to share that there is going to be a 12 Days of Christmas Crop starting on November 12!! 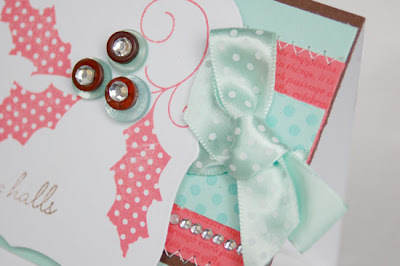 Each DT member has created a holiday themed project and one will be posted each day. There will be chats, prizes and loads of fun! So, mark your calendars. You can check out the info. here at Inspire Me. The supply lists have already been posted, so you can start gathering the supplies now. 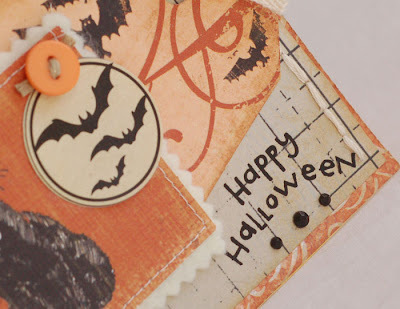 I have a few more Halloween things to share this week. 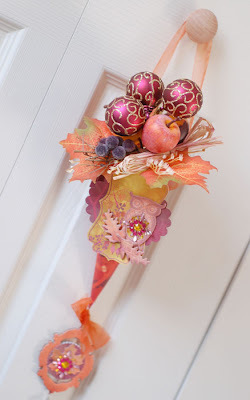 This project is one that I did for the Tattered Angels blog. 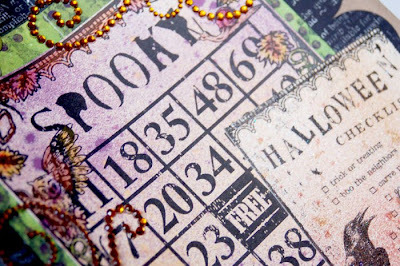 I used the Halloween Bingo Boards and calling cards. First, I colored the Bingo board. 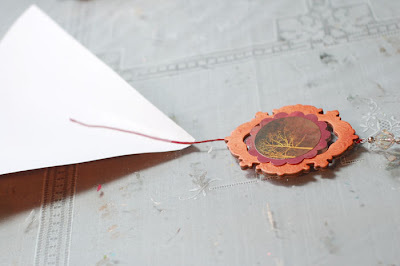 Then I sprayed it, along with the calling card, with Run Raisin, Harvest Orange and Jack-O-Lantern Glimmer Mists. 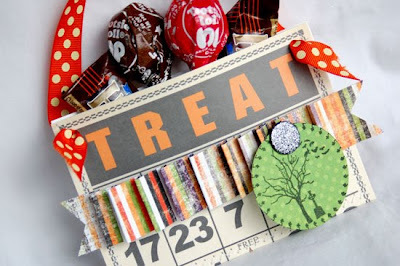 I added some glitter to the Halloween Checklist. 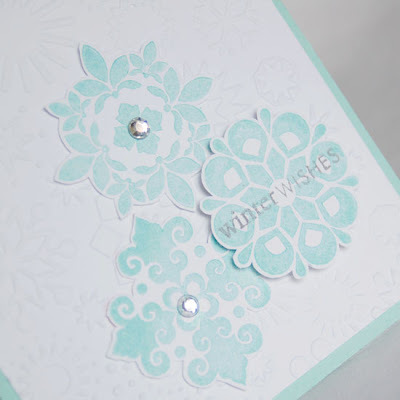 Next, I did some embossing using the Garden Gate glimmer screen. I ran it through my Wizard machine, cut it out and added some black ink. 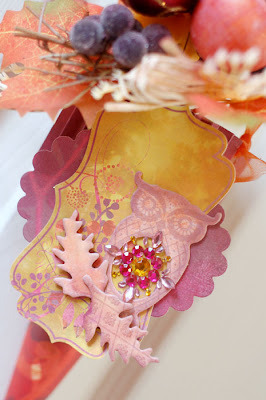 Then, I adhered everything to some Pink Paislee paper and added some Zva gem swirls. 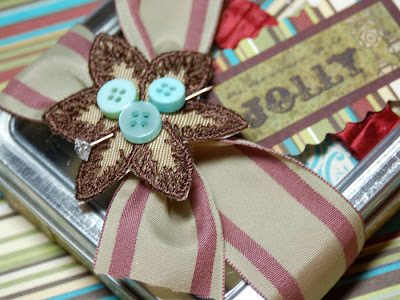 Some ribbon and a fun tag finished it off! So, that's it for today. I have a sick one home today. He has a fever. Hoping that the flu hasn't found it's way here. 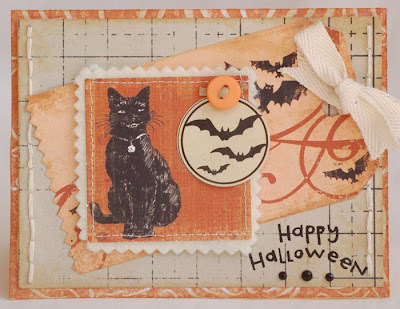 I thought I'd share a couple of Halloween cards that I don't think I've posted yet. 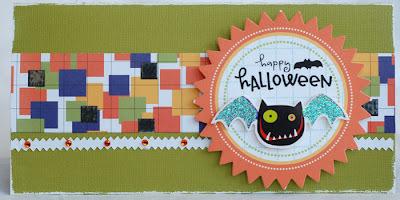 This first one was in the October issue of Papercrafts. The paper is SEI and that cute little bat is a Me and My Big Ideas sticker. 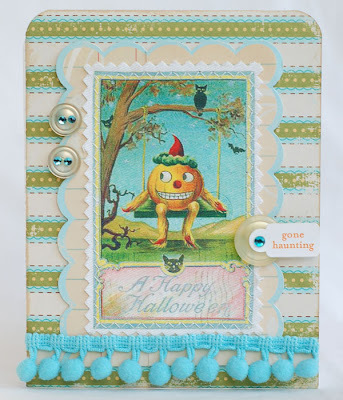 This next card is one I made using some My Mind's Eye goodies. I did some stitching on the side. It's in the Octoer issue of Cards. And finally this last guy. 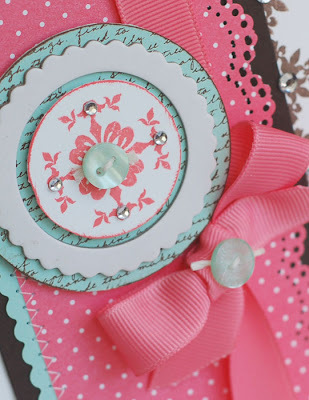 I LOVE this Crafty Secrets image. Isn't he the cutest. The paper is Making Memories and the trim is Webster's. Well, that's it for today. Thanks so much for stopping by and have a great day! I feel waterlogged! We have had rain here for the past four days. Ugh! I think I know what it must be like to live in Seattle now. The one good thing is that it's supposed to get up to 70 again by the end of the week. I'm glad because I'm just not ready for winter weather yet! I have a really quick project to share with you all today. 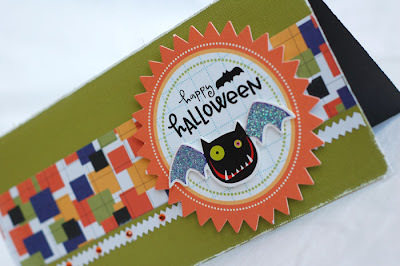 At Emma's Paperie, we all designed easy Halloween treat containers. I decided to make little Bingo card pockets. 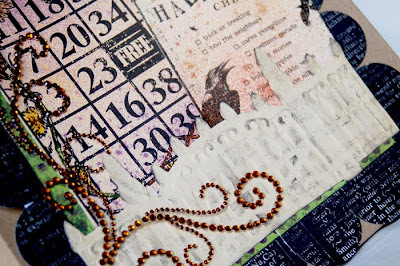 I just folded the Jenni Bowlin bingo cards in half, stitched them up and added some embellishments. 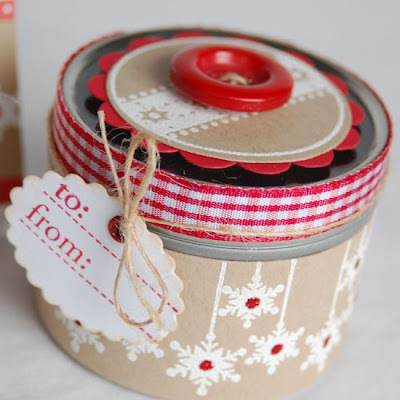 I finished them off with ribbon handles. Very quick and easy. I think these will go to my co-workers. You can see the rest of the projects HERE. 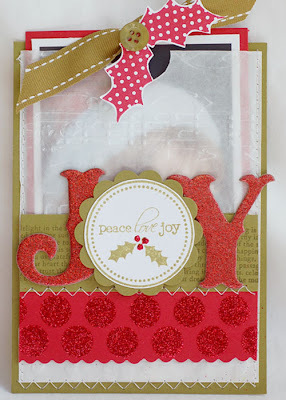 I have one more Papertrey project from this month's release to share with you today. 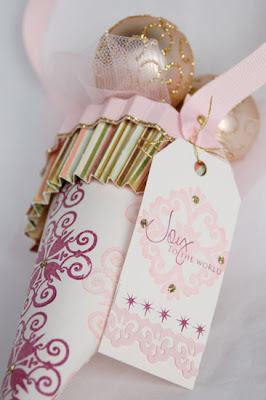 I just love the Holiday 2009 tags set! It's so versatile! 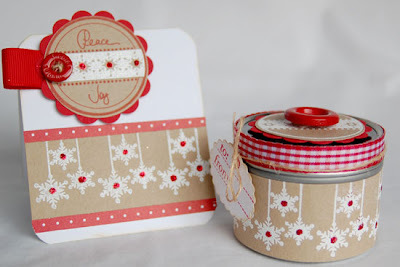 For this last project,I decided to make a gift tin and card set. 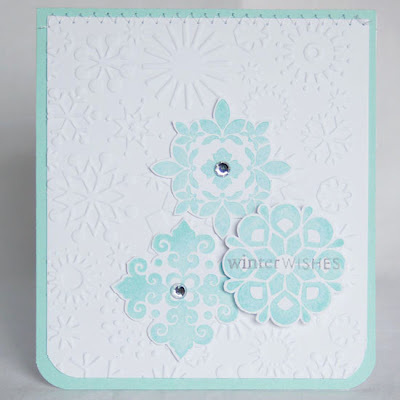 I created the snowflake border by stamping the snowflake trio over and over on a cardstock strip. 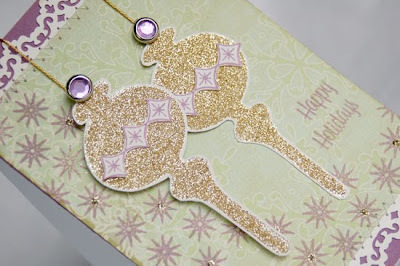 Then, I heat embossed it with white powder and added a glitter dot center. 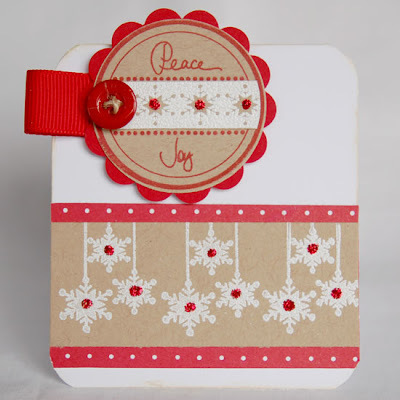 For the card, I stamped one tag in red, then stamped another in white. 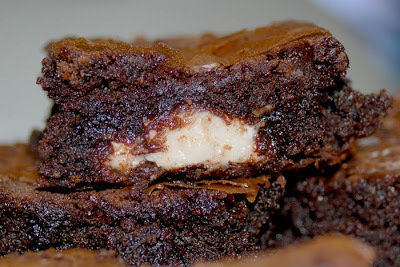 I cut the center from that one and layered it over the first. 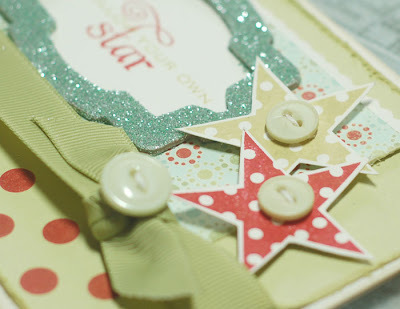 More glitter and a ribbon/button tab rounded out my tag. Here's the whole set. I think I'll fill it with a few starlight peppermints and give it as a little token gift at Christmas. It would be an understatement to say I've been having so much fun this week! 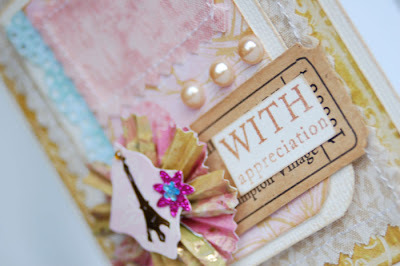 I've been in Papertrey Heaven! 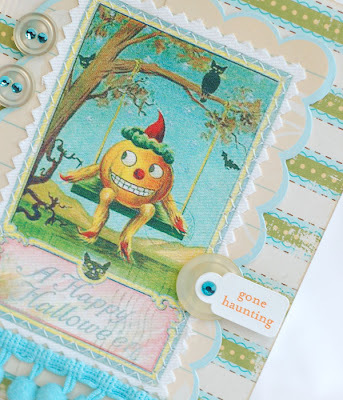 I'm just loving having the chance to create with the October stamps. They are great! 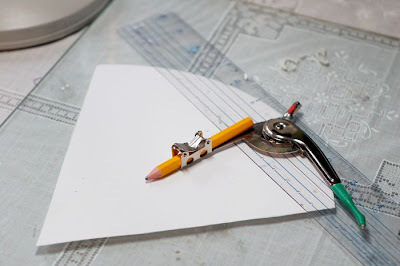 I have a few projects to share with you tonight. 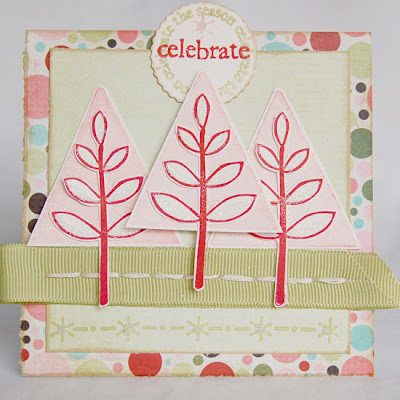 This first one uses stamps from the Holiday Tree collection. 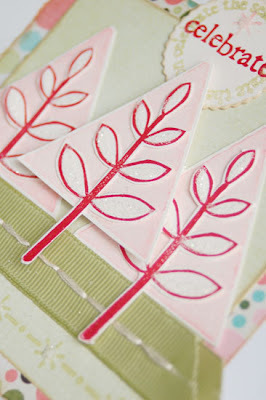 I stamped the tree with Sweet Blush and then the leaves with Pure Poppy. 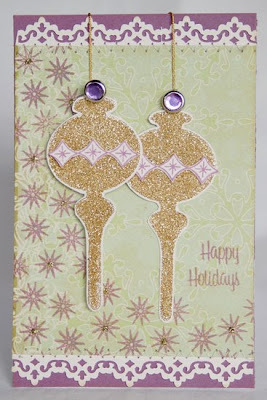 I cut them out, added some glitter and layered them onto the card front. 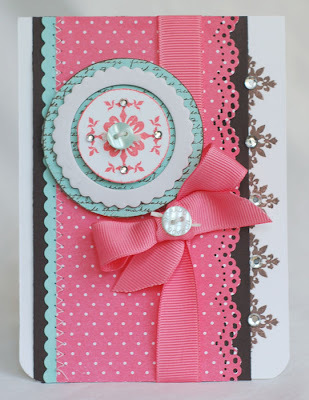 Next up is this quick and easy card using Giga Guidelines. When I looked at the images, I saw snowflakes! 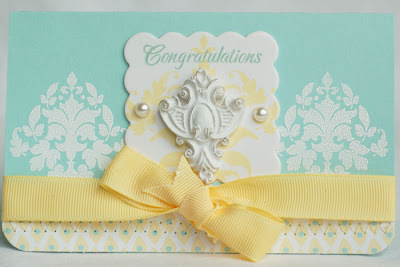 I embossed the cardstock and stamped the images using Aqua Mist. I cut them out and added them to the card. 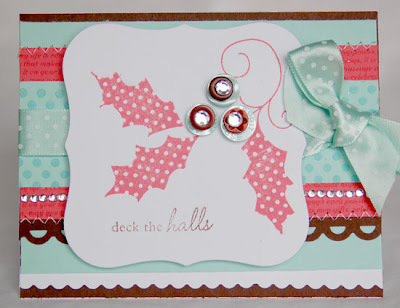 The sentiment is from the Holiday Tags set. My final project for today also uses Giga Guidelines. I love making Tussy Mussies! 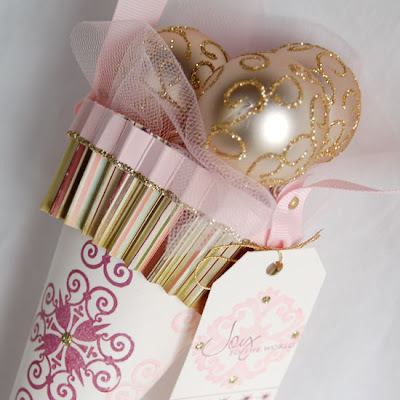 They can be hung as a decoration, used as a decorative place 'card' or filled with something special and given as a gift. 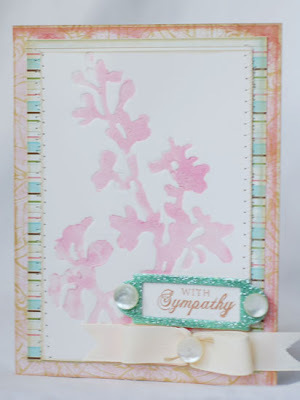 I used Sweet Blush and Scarlet Jewel to stamp the images. 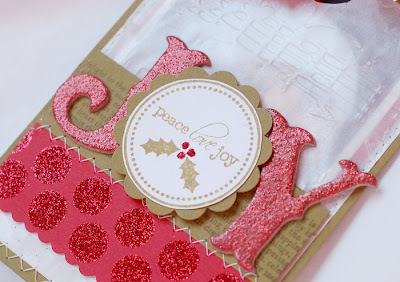 The tag has a sentiment from Signature Christmas. I've been whistling Christmas songs all week! It's fun to get into the spirit of things a bit early. Stop back tomorrow. 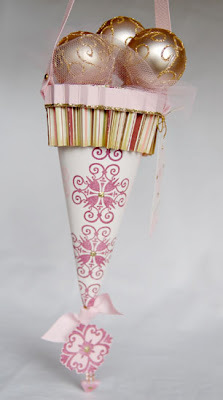 I'll be posting more of my Papertrey creations!